If one went into Highly Strung 2 expecting it to be an ordinary concert, he would have immediately dispelled that belief the moment he stepped into TheatreWorks 72-13 last Friday night. 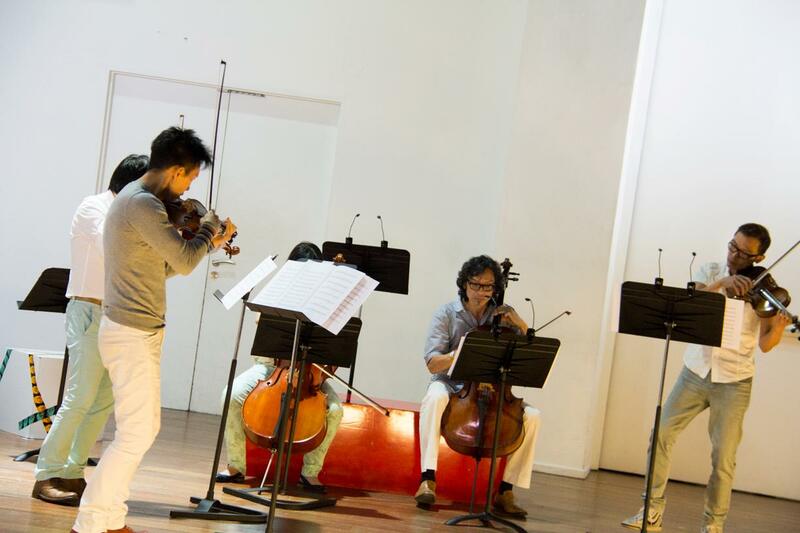 Notably hosted in an atypical stripped-down venue very different from a conventional concert hall, members of the Raffles Chamber Ensemble performed two shows with the acclaimed T’ang Quartet, which showcased emerging Rafflesian talent alongside the seasoned musicians and their protégés, both private students and students of the Yong Siew Toh Conservatory of Music. Highly Strung 2 was presented in a highly unusual setting at 72-13, a warehouse converted into a makeshift stage for the performance. A light strip demarcated the the stage area, with blocks sporting the trademark ARTS SEASON 2013 tape and sparsely scattered chairs replacing the typical concert grand stand. 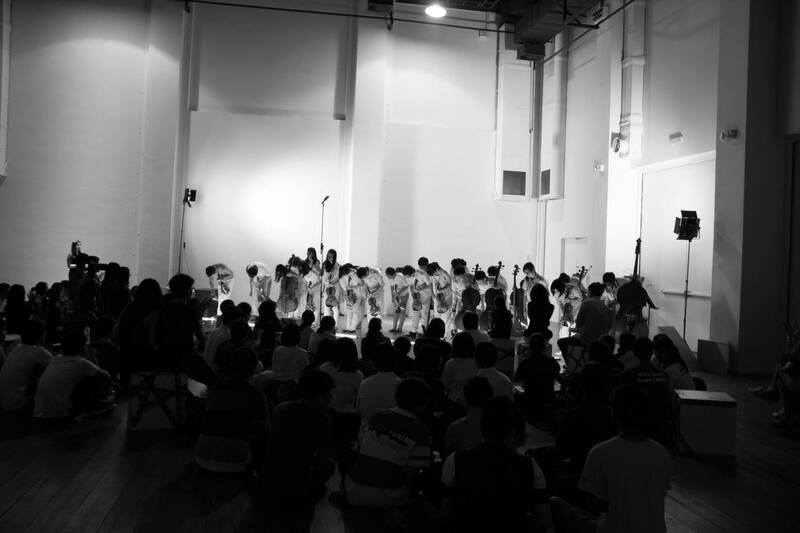 In fact, after overcoming their initial surprise, much of the school crowd chose to sit on the floor, themselves participating in the artistic experience by ‘interpreting the space’ as they scattered themselves in knots, selecting their preferred angle of view. All musicians were visible throughout the performance, entering and exiting with seamless informality from a visible holding area, demarcated only by more Art Season tape. In the absence of a distant raised platform or backstage area to separate performers from audience, the arrangement offered a real sense of intimacy, which was enhanced by the smart casual pastel colours of the musicians’ untraditional performance attire. Furthering the sense of immediacy was the absence of emcees and programme notes, which kept the audience intrigued and obliged to meet the series of musical offerings on their own terms throughout. The ensemble for each piece was regularly rotated and kept small, in keeping with the intimate venue and the convention of a traditional chamber ensemble – although many offerings were subtle and innovative, at times almost atonal, and far from traditional. The programme opened with two extracts from Carl Nielsen’s well-known Little Suite, starting slow with the Praeludium, before moving on to the Finale, where earlier themes were revisited at a higher tempo, as the piece soared to a synchronic climax. Next came Peter Warlock’s Capriol Suite, played out of the usual order, with the second movement Pavane placed first and – a pleasant surprise – serving as a fitting introduction to the rhythmic Basse-Danse (normally the first movement). There was a sense of movement in the music throughout, and of liveliness and spirit in the Basse-Dance especially, which was quite in keeping with the origins and intentions of a dance suite. There followed the truly unique Fantasia on a phrase by Monteverdi. This is not a piece by the famous Claudio Monteverdi, but a contemporary work by Tomas Friberg, a wildly cinematic score, presented by a row of 8 instrumentalists. The symmetry seen on stage was juxtaposed with the almost discordant score to create a sense of discomfort. The piece seemed to bounce from one instrument to another, at times swelling in volume, at times dissolving into near silence, as the musicians subtly hovered around semitone intervals, which somehow managed to wander hypnotically and disturbingly without losing a thread of central melody. The Fantasia served as introduction to a further series of innovative modern offerings, beginning with the bright and sprightly Le diverti se ment by Jean-Philippe Goude. The title is perhaps a pun on the French term divertissement, or a light piece of music often played for entertainment, and suggests ‘the entertainment lies’ or ‘the entertainment lies about itself’, without actually forming a properly grammatical sentence. The energy put into this piece was truly infectious, and not at all dissipated by the closing cheeky pizzicato note. It was taken up in Maurizio Bignone’s Il mistero di cossyra, the next offering, which alternated unison passages with solos in a musical car-chase of high drama. A string of quartets followed, including Passamezzo, Arvo Pärt’s Summa, and Schnittke’s Polka. The first was a melodious treat, a series of comfortable mid-range notes embracing the audience warmly, before the Polka raised the pace and pitch. In contrast, Summa was a classic showcase of Arvo Pärt’s minimalist style, rocking between different harmonies, steady and meditative. Gopak by Modest Mussorgsky was the finale of the night, bringing all the Raffles players onstage, playing scoreless and with zest, ending the night on a joyous and triumphant note. As a whole, the concert featured a varied repertoire, not only exploring contemporary works but also giving a modern twist to the traditional close-knit affair of chamber music. 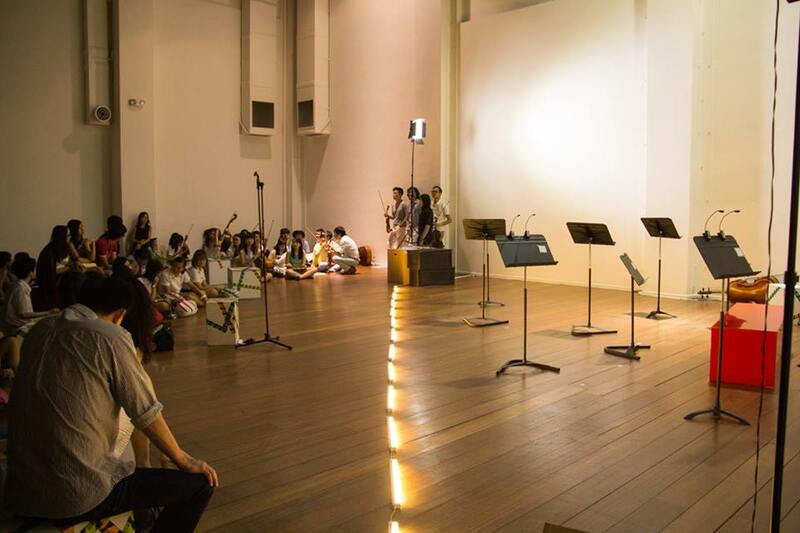 Although the audience may have been initially slow to respond to the unfamiliar setting and the experimental nature of some works, the event surely turned out to be a musical education for all. After the concert we spoke to members of the T’ang Quartet, Mr Leslie Tan (cello) and Mr Lionel Tan (viola), both alumni of RI. Lionel agreed that “the pieces are designed and programmed in an unconventional setting and with an unconventional rethinking of the concert programme flow.” But he expressed that the selection of pieces was felt to have the potential to appeal to a young target audience. 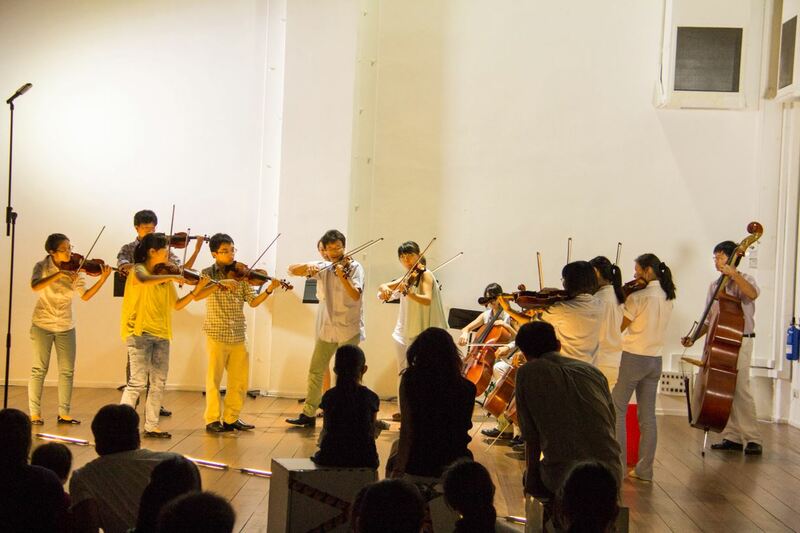 Lionel explained that Highly Strung II was part of The Ensemble Dimension Project, which aims to “harness the power of youth” and develop talented young players. 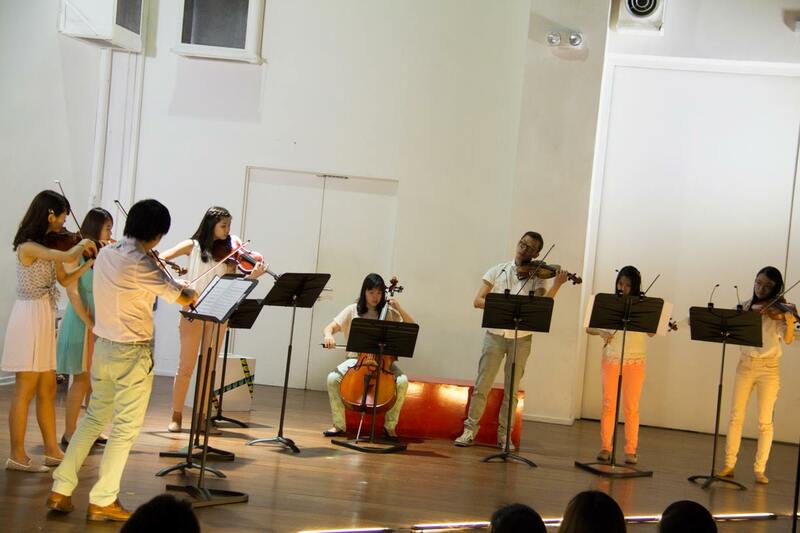 It arose when the T’ang Quartet was approached by the RI Aesthetics Department to work with the Chamber Ensemble, a first for the Quartet, who had previously involved young students in Highly Strung I, but had never before undertaken a full scale collaboration with a school ensemble. T’ang actually hesitated to agree to the project at first, until after they held auditions at RI. At this point, they were duly impressed and, as Lionel put it, thought “Ok, this is the kind of talent we’re looking for!”.